BACK ON THE MARKET 10/31/17 - HURRY! LOTS OF INTEREST IN THIS HOME! 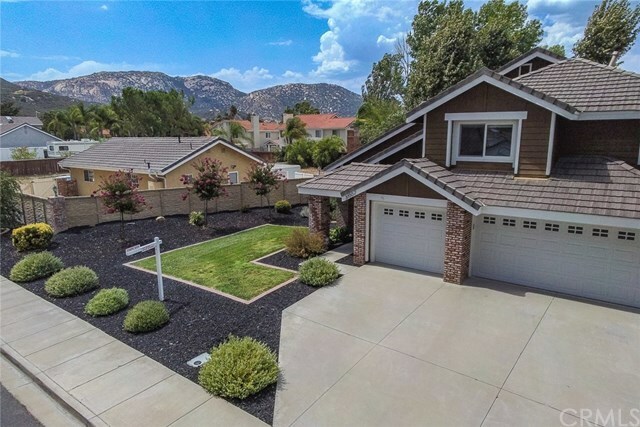 Lovely ESTATE on over half an acre in south TEMECULA. Quiet, tree-lined CUL-DE-SAC. MAIN HOME is approximately 2600 sq.ft. and includes 4 spacious bedrooms, 2.5 bathrooms, FORMAL LIVING ROOM WITH FIREPLACE, FORMAL DINING ROOM, UPGRADED KITCHEN, SEPARATE FAMILY ROOM WITH ANOTHER FIREPLACE, plus 3-car garage. Custom paint throughout. Newer exterior paint. Kitchen has CUSTOM STONE COUNTER-TOPS, plus SEPARATE WET BAR and buffet near the Family Room. Master Suite includes French Doors to the BALCONY, with views of the local hills and JOURNEY GOLF COURSE, plus walk in closet, separate oval soaker tub and shower. NEW DUAL PANE VINYL WINDOWS throughout the home. Downstairs bathroom and upstairs hall bathroom have been remodeled with custom counter tops, cabinets, and mirrors. Quiet-Cool whole house fan. New water heater. Newer furnace. Lots of room to entertain!! Second building is approximately 900 sq.ft. and includes eating area, living room, tile flooring, separate air conditioning, separate water heater, Quiet Cool whole house fan, large game room, 3/4 bathroom, and laundry area. Separate gated entry. RV Parking with hookups and clean out. OUTSTANDING TEMECULA SCHOOLS, plus less than a mile to Pechanga Resort!! GRAB THIS HOME BEFORE SOMEONE BEATS YOU TO IT! !